If you are reading this, chances are there’s a baby shower looming in your future. If you see the phrase “baby shower games” and automatically start cringing, you are not alone. I mean, who wouldn’t want toilet paper wrapped around them in an attempt to measure how big you actually are versus how big your friends all think you are? Ouch! Nope, me either, which is why we’ve put together this non-traditional baby shower games post. First of all, let me assure you that yes, fun baby games are possible! You and your attendees will have a blast playing these games—no awkward moments for the mom-to-be required. Trust me, there’s life outside of eating baby food blindfolded. Here are 21 non-traditional baby shower games that are actually really, really fun! Blindfolded diaper changing. If you have a competitive group, this game would be highly entertaining for the mom-to-be. Split into groups of two (or even three or four!) and let everyone who wants to participate don a blindfold and race to change the diaper on a baby doll. Bonus points if you slather something sticky and gross on the doll beforehand. Decorate a onesie. Grab a pack of plain, white bodysuits and some fabric markers, and let everyone get creative. 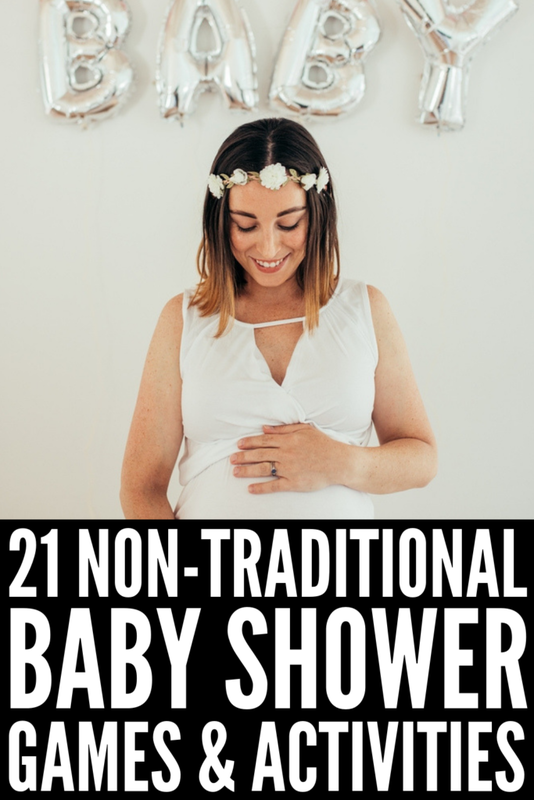 What is great about this is people can do this on their own time throughout the shower with no pressure, leaving the mom-to-be with some great keepsakes at the end. Guess the celebrity. Print off some celebrity baby pictures, then hang them on a wall. Hand out pieces of paper for attendees to guess who each celeb is! You can make this game a little easier by also having a board with the grown-up version for them to choose between and guess. Create nursery art. A fun and low-pressure game are for attendees to help create some pretty nursery art for the baby. There are so many different ways to do this—you can ask everyone to paint their own flower in a field or let people go completely abstract in a nature scene, but either way, the goal is simple—a one of a kind art piece. Change the order. Have a display strung on a clothesline such as baby shirts, bodysuits, pants and bags, then halfway through the party take it all down. Guests now have to recreate the order in their minds and write it down. This is a fun way to see who is detail-oriented and paying attention! If you are planning a more intimate shower with a smaller group, your non-traditional baby games can get a little more personal. Here are five ways how! Guess the baby. Ask everyone attending the shower to bring a baby picture of herself. Then, have everyone pin them up on the board and let your guests guess who each other is. Play Babies Against Parenthood. If you are a fan of the game Cards Against Humanity (and if you aren’t, you should be!) you will love this hilarious parent-themed game. It would have to be a pretty small shower to play this game, but if it is…do this! Baby-themed charades. We all love a good game of charades, so why not play it at a shower? To make it baby-appropriate, make sure all the options are baby themed. You’d be surprised how fun this could be—give your best dirty dancing impression a go because, after all, no one puts baby in a corner. Tell two truths and a lie. Pick a theme and ask everyone to participate by telling two truths and one lie surrounding that theme. Guests should write down their guess as to which is the lie. Whoever gets the most correct wins. Some ideas include old wive’s tales, funny baby stories, best baby advice, etc. Most embarrassing baby story. A small shower allows everyone to have a chance to speak during this fun game. Let everyone share their most embarrassing story either from their childhood or their children’s’ childhood. Believe it or not, we all can dig deep and think of a traumatic moment dealing with children! I love minute to win it type games! Set a timer for one minute and get ready to compete with these non-traditional baby shower games! Pass the paci. Split into teams and provide each person with a straw, which they will put in their mouth. The first person in line can thread their straw through a pacifier handle. When the timer starts, they must get it onto the next person’s straw—without using their hands! Hang the diaper. This game works particularly well outdoors. Provide clothespins and diapers, then let people have one minute to see who can hang the most down a clothesline. Bonus—mom and dad get to keep all the diapers from the game! Match baby’s socks. Purchase a few dozen baby socks and jumble the pairs in a pile. Participants have one minute to try to pair as many socks as possible! Ice, ice baby. Freeze a few dozen small plastic babies within an ice cube tray. Pass out the frozen cubes and let people race to unfreeze as many babies as they can. What’s a baby shower if it isn’t entertaining? These games will make the mom-to-be laugh, along with everyone else! Make it to the toilet. This is definitely a non-traditional baby shower game! Pass out pennies to each person in a team that is lined up. The first person waddles to a pot placed a few yards away with the pennies held firmly between their legs. They must drop the coin into the pot without using their hands. Once they have gone, it’s the next person’s turn. Get the wipes. Buy a few packs of inexpensive baby wipes and pass them out to participants. The goal is simple: remove the wipes one by one from the container as fast as possible—winner gets the prize! Paint your toes. Provide polish and ask everyone to sit down and take off their shoes. Hand each person a large balloon to slip under their shirt and let them get to work trying to paint their toenails. Those who participate in this hilarious non-traditional baby shower game get to take the nail polish home with them. Ah, my favorite. The humble co-ed baby shower! I opted for a co-ed shower myself, but banned any games because I had no idea games could be this fun! Maybe for our next kid, I’ll choose a few from this great list of non-traditional baby shower games. Finish the bottle race. Everyone is going to be thirsty at the shower, so why not make drinking entertaining? Fill infant baby bottles with a beverage of choice like soda, wine, or straight water, and let people compete for the title of the fastest drinker. Play the Price is Right. Grab 10-15 baby items like a pack of diapers, a food pouch and wipes, and let guests guess the correct price (without going over!). Then, mom and dad get to keep all the goodies! Mama’s cravings. Have you had weird cravings during your pregnancy? If so, poke a little fun at it by letting others experience your cravings with you in this non-traditional baby shower game. Serve a “create your own craving bar” and let attendees guess at what your favorite meals have been—prize for the closest and the most creative! Play baby pictionary. Break into teams and take turns sketching out baby-themed phrases like “up all night”, “2 am feeding” and “diaper blowout”. Art skills not required! Which non-traditional baby game on this list are you looking forward to playing most? So fun, right? If you liked this collection of non-traditional baby shower games, please share this post on Pinterest! And if you’re looking for parenting tips and advice to help you from birth through the teen years, please follow our Parenting board where we share all kinds of helpful ideas we find each day!